Our best rechargeable light. Read music for over 8 hours on full brightness and 36 hours on half brightness. 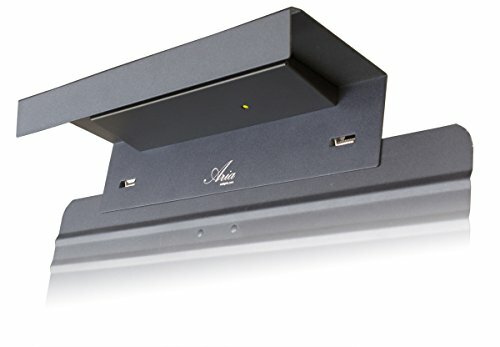 Perfect for gigging indoors or out, stages, pits, or chamber music, the Aria Forte delivers bright, consistent light across a full-sized part up to 4 pages wide. A full-range dimmer lets you match the light level to the environment and conserve battery power. Forte maintains constant brightness right to the end of the charge. An LED blinks to indicate how much charge is left and provide low battery warnings. Forte can be used on wall power up to 9 feet from an outlet and supports USB chargers. Rapid recharge provides fast turnaround between events, and can charge during use. Includes a 120-240V USB charger, a nine-foot (2.75 m) cord, and a replaceable high-power lithium polymer (LiPO) battery. One-year warranty. 4 watts. Model F1. Full-range dimmer and built-in battery gauge. 9 ft (2.75m) cable and USB charger included. If you have any questions about this product by Aria Lights, contact us by completing and submitting the form below. If you are looking for a specif part number, please include it with your message.